Berland portable field and display easel for artwork and business presentations. Stands 71 inches tall with legs at their minimum working distance and 66 inches tall with legs full spread. 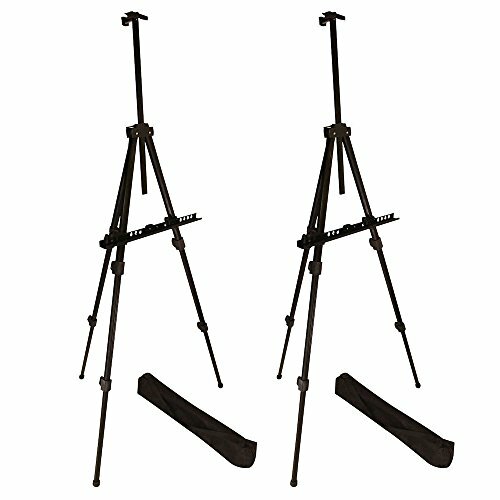 Easily adjustable design folds to 23 3/4 inches for convenient storage and transport. Holds a canvas up to 36 1/2 inches tall. The support tray is 18 inches wide, but can hold much wider projects. The easel is rated to 20 pounds. Includes a carrying bag w/ shoulder strap. Minimal assembly required. Instructions included. Carrying weight is 2.3 pounds. Holds projects with height of 36.5 in. Folds stored to 23.75 in. Max project thickness is 1 and 1/16 inches. Project bottom sits as high as 43 inches off floor. Display posters, art, chalkboard. Holds charts, white board, or cardboard-backed flip pad. Long-lasting black aluminum frame. Minimal assembly. Includes carrying bag and instructions. If you have any questions about this product by Berland, contact us by completing and submitting the form below. If you are looking for a specif part number, please include it with your message.